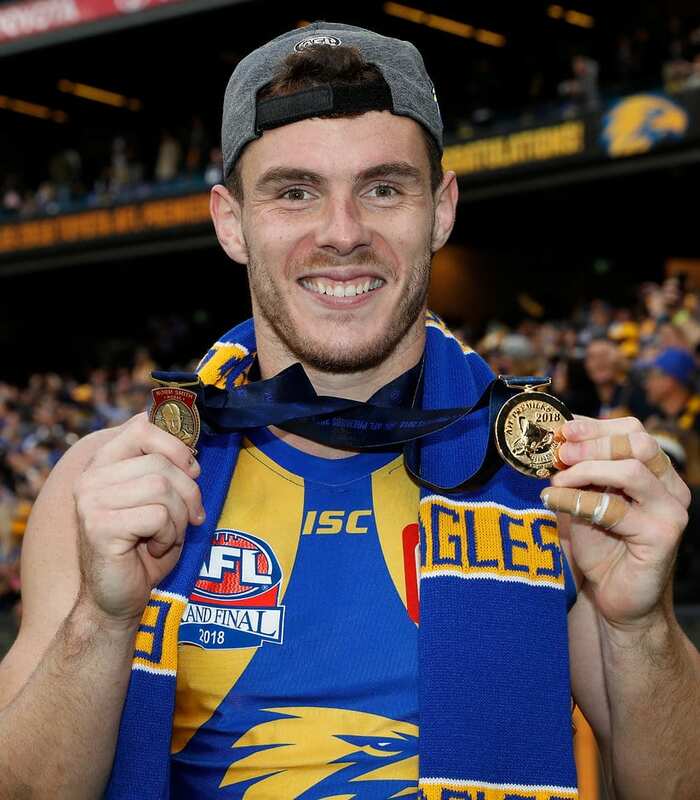 Luke Shuey might have had an indifferent season, perhaps nowhere near his best in Eagles colours, but on Saturday he was the class that separated two sides in a thrilling Grand Final. Now, the supremely talented West Coast midfielder has a Norm Smith Medal to show for it. The Eagles came into the season having lost Brownlow Medal winners in Sam Mitchell and Matt Priddis to retirement. They then lost a Brownlow Medal contender in Andrew Gaff late in the year to a season-ending suspension. A relatively new-look midfield needed a leader. In every key moment during Saturday's Grand Final, Shuey was that man. The line-breaker when West Coast needed a spark, the contested beast when the Eagles needed a hard body to crack a pack – Shuey did it all as his side's match-winner. His stats told the story. He finished with a game-high 34 disposals, a game-high 19 contested possessions, a game-high nine clearances and a game-high five score assists. His eight tackles and eight inside 50s complemented a stunning performance. It resulted in 11 of a possible 12 votes from the four Norm Smith Medal judges, of which three deservedly ranked the 28-year-old as the best player on the field. "It's bloody unreal," Shuey told AFL.com.au after the match. "I'm still pinching myself, I'm waiting to wake up. We're going to enjoy this one. "Everyone stepped up today, I don't think we had one passenger. Everyone contributed in their own way. From Dom Sheed's goal at the end to Jeremy McGovern's marks in the first quarter, everyone played their role and we've done that all year." Shuey's first half was magnificent. He had 18 disposals, six clearances, five tackles and a goal to the main change. It forced Collingwood coach Nathan Buckley to move tagger Levi Greenwood from Elliot Yeo to the West Coast ball-magnet at the start of the second half. But it mattered little. He still won a further 16 touches, three clearances and three tackles after the main interval to inspire West Coast's remarkable come-from-behind five-point win. "That's why teams tag him," Yeo told AFL.com.au. "That's why Levi went to him at the start of the third. He's just an absolute freak. "His ability to change games like that is phenomenal … just wow." When the Eagles were languishing late in the first quarter, trailing by 29 points after an early Pies onslaught, the fears over their inexperienced onball brigade were brought to the fore. The West Australians had fought valiantly. But maybe the loss of Priddis, then Mitchell, then ruckman Nic Naitanui, then Gaff would be too much to cope with. Even for them. But it wouldn't be happening on Shuey's watch. Willing West Coast back into the match, Shuey's remarkable bursts from standing starts at stoppages instantly pulled the Eagles back into the contest and gave them the vigour and the flair that they had lacked throughout a sluggish opening 20 minutes. His goal late in the second quarter, which reduced West Coast's deficit to just 12 points, was emblematic of his afternoon. He read the ruck contest perfectly, sharked the footy and used his raw speed to earn space. His finish on the run was all class. The bounce that took the kick through for a goal might have been rather fortunate. But if anyone deserved a little bit of fortune for their efforts on Saturday, it was Shuey. Together with Sheed, who was also influential and ultimately kicked the match-winning goal, Shuey's desperation clawed the Eagles back to within 12 points at half-time. But if you thought he was done then, his first act in the second half – now tagged by Greenwood – resembled what made him the dangerous player Collingwood feared. Winning the clearance, Shuey burst from the pack and hacked a kick forward to Josh Kennedy. Such an act was why he led everyone on the field for metres gained with 663m. Kennedy kicked the goal, the Eagles were back within six and ready to shift the momentum. With his partner, Dani, and his newborn baby, a son less than a month old named Oliver, watching on from home in Western Australia, Shuey was having the game of his life. "It makes everything worthwhile," Shuey said. "Seriously, it doesn't get any better than this. This is what we play for. "It's been a big fortnight and it's a nice way to cap it off. Unfortunately, they couldn't get over, he's a bit too young, but (Dani) has been as big a part of this as anyone for me." With a wry smile, Shuey then clutched the two medals around his neck and said: "I wish they were here, but I'll bring these home for them." Of the many people clinging to Shuey in the victorious West Coast rooms after the game, desperate for selfies and a look at his Norm Smith Medal, his mum was the proudest. Watching her son's every move intently, you could hardly wipe the smile off her face. "I'm extremely proud of him and the whole team," Michelle told AFL.com.au. "When he was five, that's when I knew. You couldn't get a ball out of his hand. "I'm very proud. I was dreading it, that we were going to relive 2015 again. But they've done it. It's awesome, it's been a great month."